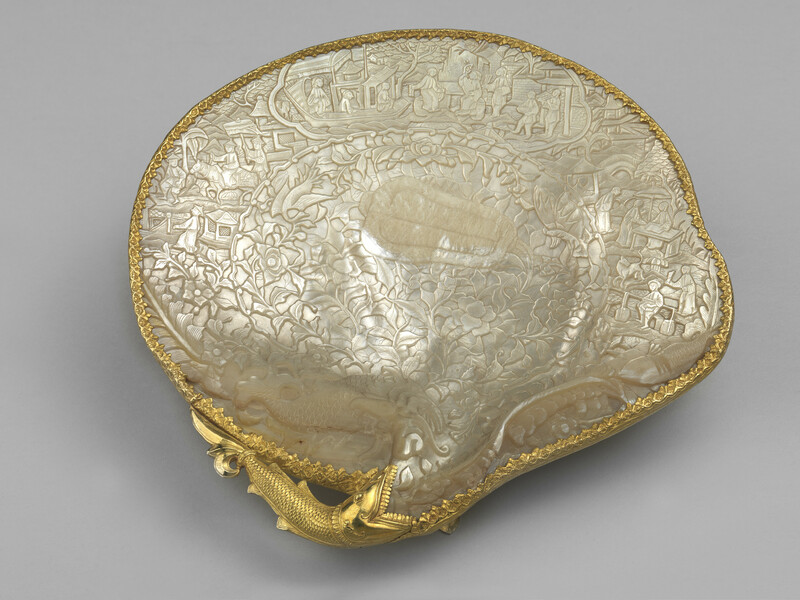 A mother-of-pearl shell carved with Chinese motifs and figures mounted in gold to form a card-tray on three feet. The gold mount near the tip of the shell chased to resemble a fish. The gold mounted on the back of the shell decorated with a border and roundel chased and incised with floral motifs. The shell is likely to have been carved in Canton, modern day Guangdong, in China. Shells such as this example were made for the export market and thus carved with recognisable Chinese scenes of daily life. The shell mount is Indian in style and design. An inscription in Gujarati on one of the feet suggests that the mount was made in western India.